Tonight Author Cassandra Clare had some very exciting news for those who joined her live chat and those who went to her book signing in NYC. You've probably heard by now about the new Mortal Instruments book, City of Fallen Angels that is due to be released April 5 (my birthday....fate, I think), but Cassie tells us that this book is going to be the first in another THREE Mortal Instruments books!! That's right...that makes six Mortal Instruments books all together! The new books are titled City of Fallen Angels, City of Lost Souls, and City of Heavenly Fire. This book cover isn't the official cover, there will be a new cover soon. She said that the new books will feature all the familiar characters with different parts told from the points of view of Jace, Clary, Simon, and a few of the other minor characters. I think it's really exciting to know that even though I thought this series was over, that it's not even close! Check out MortalInstruments.com to see the new books for yourself! Cassie also talked about her new book series The Infernal Devices. I recently read Clockwork Angel (read my review) and think it may be the best book I've read all year. Cassie says the second book cover, Clockwork Prince will feature Jem, so I'm hoping to see a little more of him in that book. 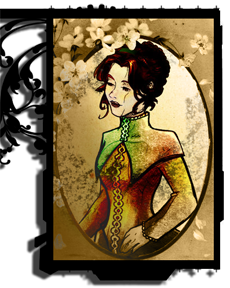 I didn't hear who the third book, Clockwork Princess will feature, but my money is on my girl Tessa. Tessa is an amazing character.So strong and determined.Do you feel like you're like her? If you'd like to read the first chapter of Clockwork Angel, you can check it out here. OR you can buy the newly released Paperback version of City of Glass which contains not only the first chapter of Clockwork, but also the first chapter of City of Fallen Angels!! Simon & Schuster has signed books five and six in Cassandra Clare's bestselling YA series, The Mortal Instruments. S&S says there are more than three million copies of the series' three published titles in print. 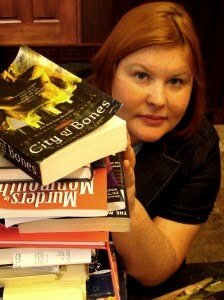 Clare launched The Mortal Instruments in 2007, with City of Bones, about a teenage demon slayer; City of Ashes and City of Glass followed. Book four, City of Fallen Angels, is scheduled for April 2011... The two new books under contract--City of Lost Souls and City of Heavenly Fire--are scheduled, respectively, for May 2012 and September 2013. Clare will also be touring, in late August, to promote Clockwork Angel, which is the first title in the prequel series to The Mortal Instruments, The Infernal Devices. Film rights to The Mortal Instruments have been optioned by Unique Features. I loved that chat! And I even watched Miss AshleyC's BlogTV for the signing event! And I am SOOOOOO happy there are two more books set for the mortal instruments so so soooo happy!!! I'm so bummed I missed the chat (for work! ), so thanks for posting this little recap. I appreciate being filled in even though I couldn't make it. I'm pretty excited about that announcement. I love love love the Mortal Instruments - so amazing. Can't wait for Clockwork Angel.